Paparazzi caught Ian Somerhalder and model Ana Beatriz Barros during passionate hugs and kisses on the set of a commercial for the Azzaro perfume. The shooting took place at a villa in Tremezzo on Lake Como in Italy - where, we recall, George Clooney lives. Ian got there on the boat and admired the local beauty on Twitter. "George Clooney, now I understand why you live here. The right choice!" Having enjoyed the nature, Ian and Ana started to work. The script was so much about the passion between Ian and Ana. The pair went to the balcony of the villa and began kissing passionately. Then Ian and Ana were blowing kisses to the delight of all below..
Paparazzi documented the process in the details. First, they have caught Ian and Ana heading to the boat to the workplace - Ian managed to communicate with groupies and take a picture. Then, the couple arrived at the villa Tremezzo ready to shoot. During the break Ian and Ana were talking, drinking water and something suspicious from plastic cups - we assume this was coffee. Gossipers wondered if Ian and Ana were having an affair? However, Ian Somerhoder denied romance with Ana Beatriz Barros. 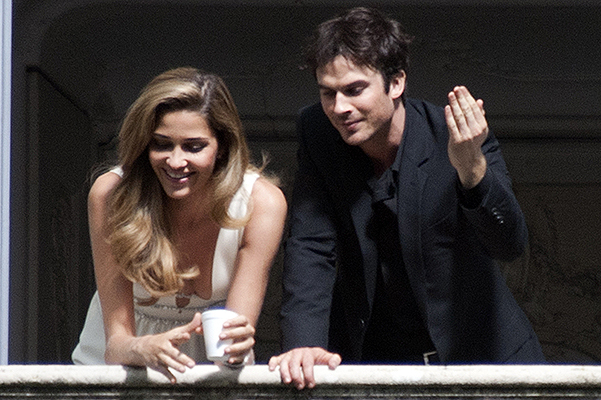 Paparazzi could feel the passion Ian Somerhalder and Ana Beatriz Barros had for each other. Recall: star of "The Vampire Diaries" starred with a model in advertising campaign in Italy, and everybody noticed the heat coming of those two. But, interestingly, Ian had a spark with Ana after the "Stop!" Command - they were so good together.. Fans of Ian wondered if the actor forgot Nina Dobrev so quickly? "Relaxing with my friend @anabbofficial - and yes, ladies, I emphasize the word" friend ", she's my friend, and special one - Ian said. - Yes, this lovely lady has a cool boyfriend - and it’s not me)). No hate - only love. If you follow her – as I do - you will see the beautiful scenery, people, and perhaps a bunch of fashion tips, which can be obtained from such a sweet, smart and very super model! Take care of my friend, whom I love in this our digital world. Love, Ian." Of course, after that fans assured that they would never be able to hate someone Ian loved so much and wished good luck Ian and Ana. She, by the way, on her instagram published the same photo, but was more discreet: "Thank you, Ian, you were cool to work, waiting for the result!